Steven Marshall’s 30 per cent approval rating is the equal lowest for an Opposition Leader in a quarter of a century and only the third lowest in the history of Newspoll, InDaily can reveal. The revelation will dull the Liberal camp’s muted celebrations at having narrowed the two-party poll gap behind Labor and heap intense pressure on Marshall’s leadership as he seeks to galvanise his notoriously volatile party-room for a concerted run to the 2018 election. His approval rating plummeted 11 points in yesterday’s poll, which was nonetheless widely portrayed as a win for the Opposition, with The Australian, which publishes Newspoll, declaring he could “rest a little easier”. But an analysis of every Newspoll result dating back to 1985, when Sol Lebovic founded the company, shows there have only been two results worse than Marshall’s on the measure of voter satisfaction with the Opposition Leader’s performance – when fledgling Liberal leader Dale Baker scored 23 and 29 per cent in succession in 1990, although his ratings improved thereafter. Marshall’s satisfaction rating is lower than anything Labor managed in the era immediately following the State Bank meltdown, and lower than anything achieved in his own party’s latter-day wilderness years. His predecessors Rob Kerin, Iain Evans and Martin Hamilton-Smith all faced leadership challenges based on poor satisfaction ratings, but never sank to the 30 per cent level Marshall reached yesterday. Significantly, the figure is 10 points lower than Isobel Redmond’s satisfaction rating when Marshall and Hamilton-Smith challenged her on a joint ticket in October 2012. The challenge failed, but Marshall went on to serve as her deputy before being elected leader unopposed when she stepped down three months later. The Newspoll was taken between October and December, at a time when the Government was reeling from soaring unemployment and the fallout of an ICAC investigation into the bungled Gillman land deal. “We’ve got a very positive strategy for this year, and we’re implementing it,” he said. 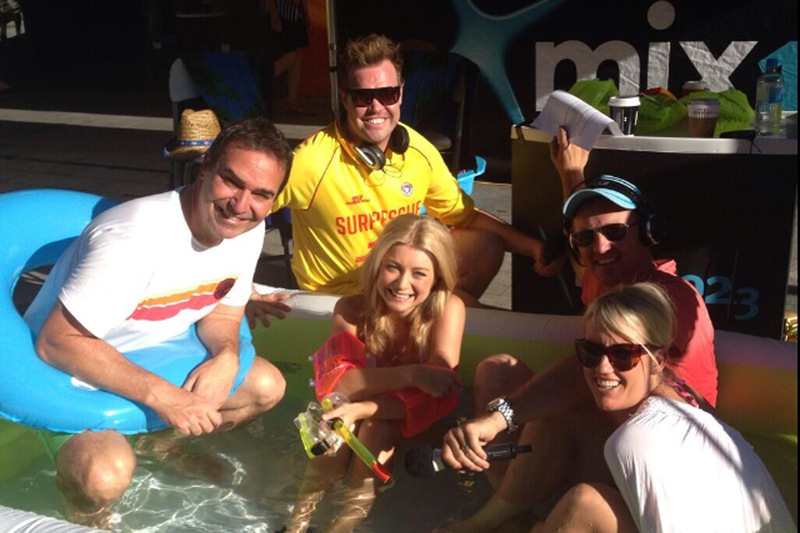 Steven Marshall at a radio stunt on the mall: his polling figures have dived, but he’s confident he can stay afloat. “People are looking for solutions – they’re not happy with the Government and they want to see the Liberal Party putting forward positive solutions and that’s what we’ll be doing. He yesterday told media his leadership was “rock solid”, with his party behind him “100 per cent”. He can take heart from the fact his approval rating has only been matched by one other leader, when Mike Rann scored a 30 per cent rating in 1999. Continuing results in the mid-to-high 30s prompted a brief push within the party to unseat him in 2001, although no formal challenge eventuated. He went on to serve as Premier for most of the next decade, recording satisfaction ratings of up to 71 per cent. Marshall would also be heartened that Jay Weatherill’s approval rating as Premier tumbled eight points to 37 per cent in the past three months – the lowest it’s been since he rolled Mike Rann in 2011.